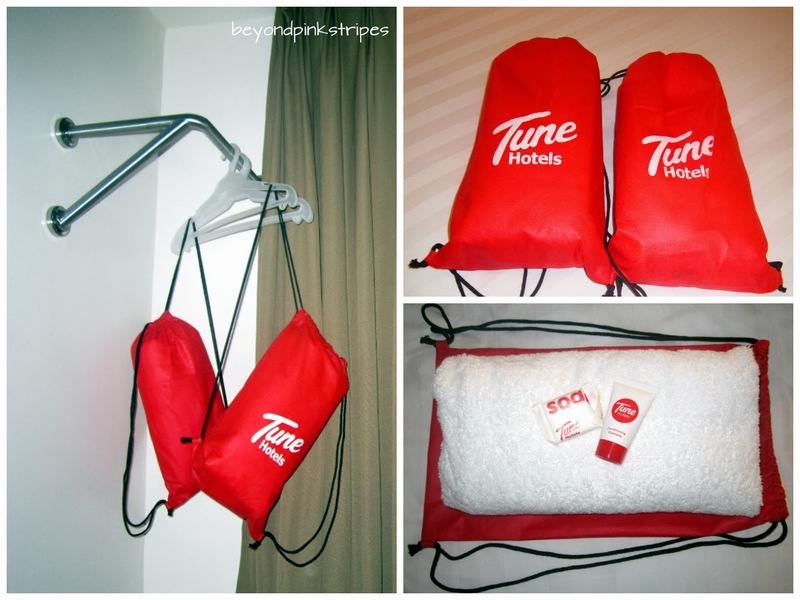 Because of the "limited service" feature, the hotel is perfect for the budget-conscious because one can opt to pay only for the basic offerings (but of high quality as claimed) to guarantee a 5-star sleeping experience at a 1-star price ---> 5-star bed and powerful hot shower. Customization can then be done by adding any of the optional services as deemed necessary like aircon, cable TV and internet access. Each add-on has a corresponding price. 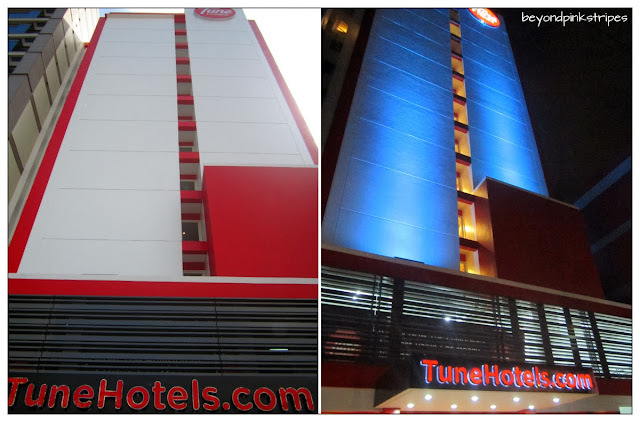 Anyway, to know more about Tune Hotels, visit their website. 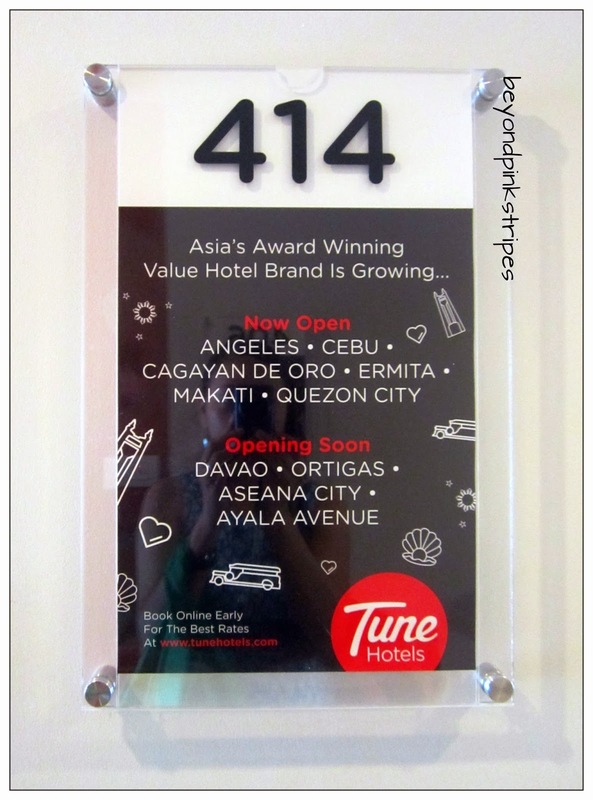 So much for the introduction, now it's time to share the unanimous thoughts of Hubby and I on Tune Hotel Quezon City during our staycation. Facade during the day and at night. We were given a room at the 4th floor. 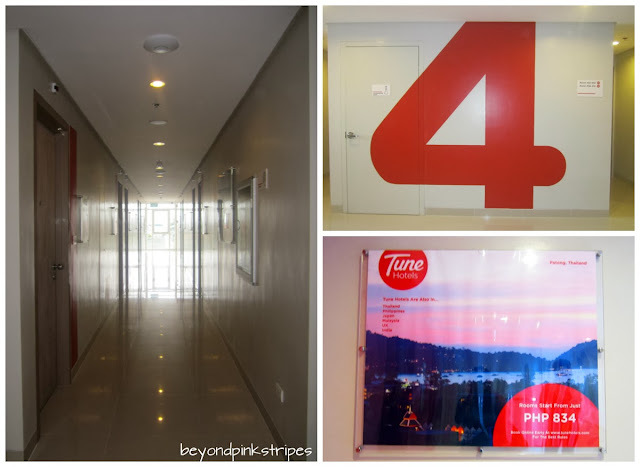 Upon stepping out of the elevator, we knew we were in the right place because of the huge number 4 in front of us. The hallways seemed a little narrow but we did not really feel claustrophobic because of the transparent door at the far end which let the light in. Compared to most that we've been into, the room's quite small but there was still enough space for the Hubby and I to navigate comfortably. 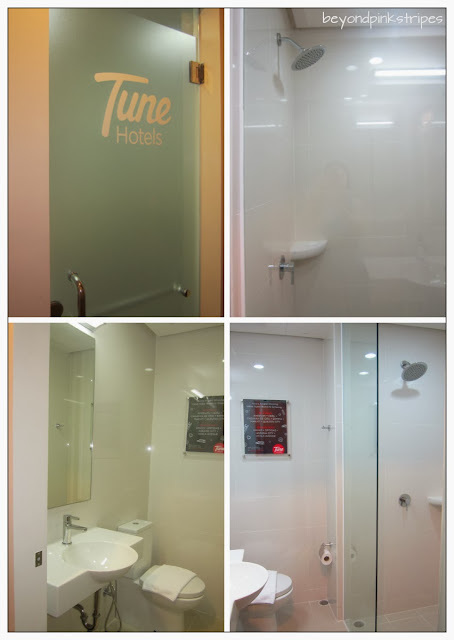 We observed though the nonexistence of the usual stuff that can be seen in a hotel room such as refrigerator, bar, coffee maker, cabinet, bathrobe, slippers, laundry bag, complimetary water, paper and pen. 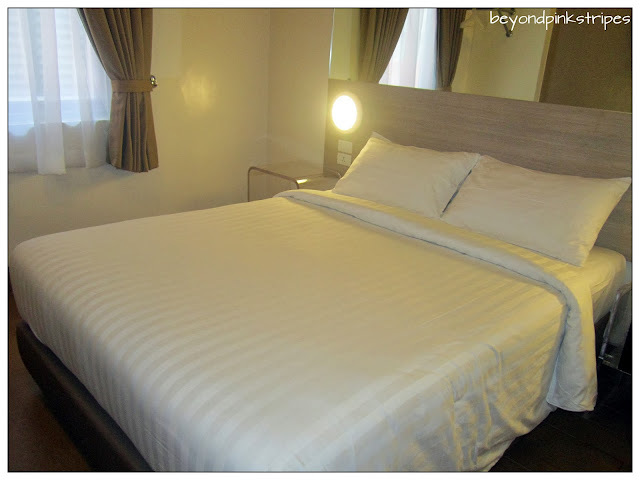 But we would have to agree with the "5-star bed" claim as the mattress felt really soft and contributed a lot to the coziness that we experienced during our staycation. Not to mention, the TV that was cleverly installed on the wall made viewing while lying on the bed such a pleasure. 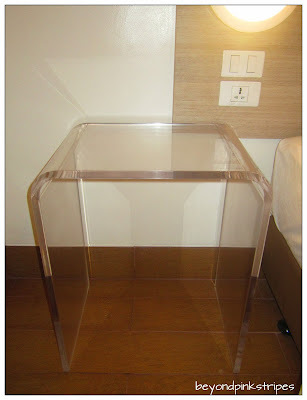 ...and the compact acrylic desk. 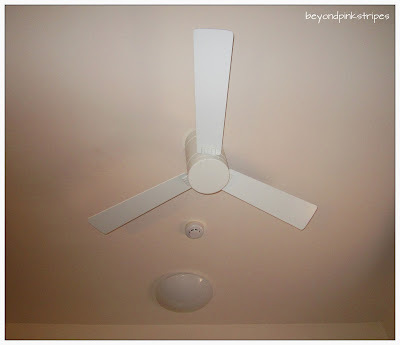 We noticed the presence of a ceiling fan. So we thought, in case we opted to forgo the aircon (very unlikely to happen though haha) to save some cash, ventilation's still very much possible. One comment on the aircon though, it was a bit noisy that for several times, I though it was raining outside. While snuggling lazily in bed, we heard a person or two walking outside our window. And then a few minutes later, we smelled PAINT FUMES. The odor got stronger that we were compelled to get up and start fixing ourselves so we can leave already. 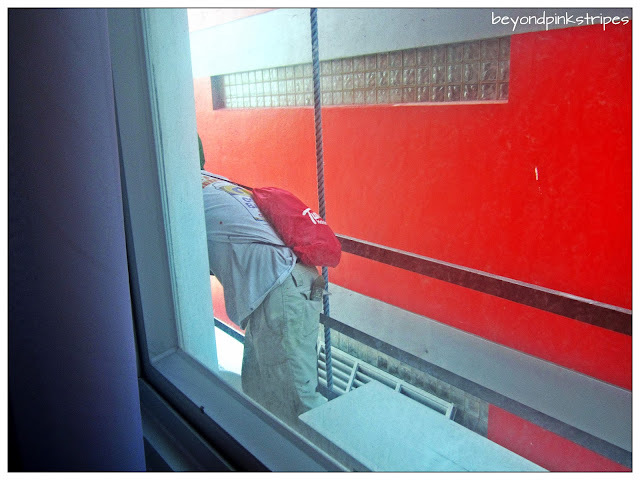 While the Hubby was showering, I slightly drew the edge of the curtain and secretly took a peek on what's going on outside our window and I saw this! 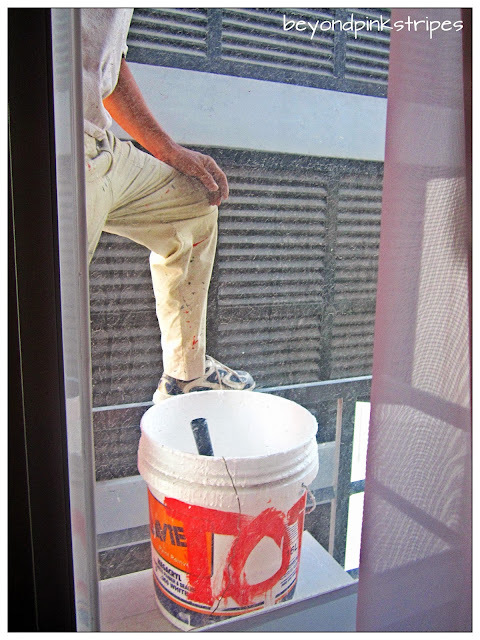 So that's why we smelled PAINT FUMES! There was a painting job happening right outside our room! 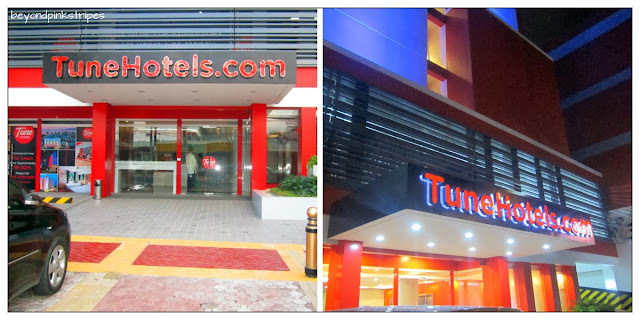 The incident sadly RUINED whatever good experience we had at Tune Hotel Quezon City. We informed the Manager of the situation and told her that we should have been placed in another room from the start since workers would be painting our side of the building come morning. To be fair, the Manager was apologetic about the lack of coordination. 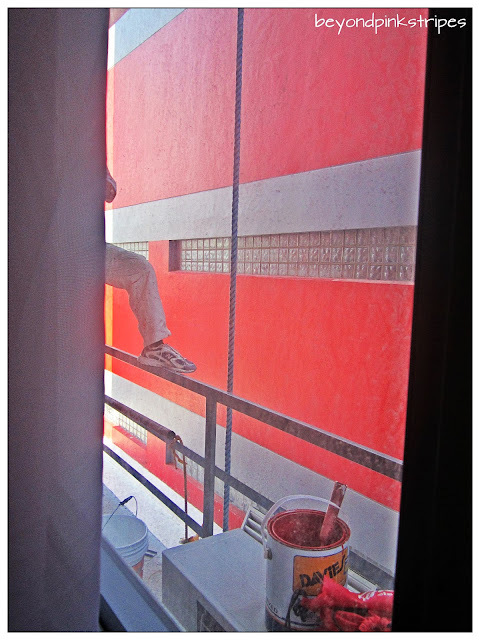 It seemed that she did not know/was not informed of the scheduled painting job. Even Manong Guard kindly asked us what happened and recorded it in his log book. For the price we paid for the hotel, some might judge that ours was a petty complaint. But we did complain with the future guests in mind so they would not experience the same inconvenience. Hubby let me do the talking because of my more diplomatic personality haha. I did not raise my voice but I believe I was firm enough to convey our message. After all, service should always be of quality...doesn't matter if it's cheap or costly. Right? This is a state of the art Quezon City Hotel. I'm browsing the net for the most affordable one. Anyways, thank you for providing a great info about this hotel.